Doug Saunders is the European Bureau Chief for the Globe and Mail, an award winning columnist and author of Arrival City, a book about the “cities” that immigrants and village-to-urban migrants create within or just outside existing cities. It is a very interesting look at moving populations and a global shift from rural to urban living. I went to hear Doug speak at an event at the Toronto Reference Library back in November and tweeted throughout. Doug then tweeted back to those of us “live-tweeting” so I took the opportunity to invite Doug for lunch over Twitter. And here we are. I was able to grab some time on Doug’s calendar as he returned to Toronto for his book tour. 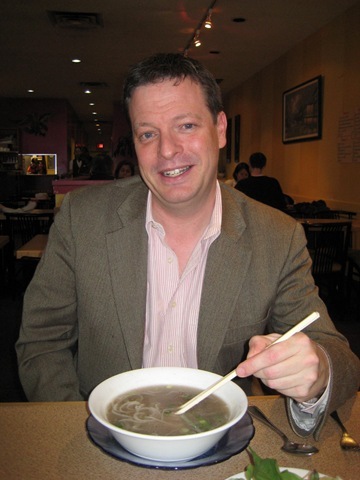 Doug wanted us to have lunch around Spadina and Dundas as it’s his old stomping grounds and it ties in with the theme of his book as a sort of arrival city for Chinese immigrants. I suggested my fave Pho Hung. However, due to a last minute scheduling conflict, we moved our lunch to the Pho Hung at Bloor and Avenue. Same great food but without the atmosphere. We both had a small #2, which is the rare beef Pho and my favourite Pho in the city. It was delicious as always. Pho Hung fact: the food at the Bloor location is less spicy than the Spadina location. We then shared the beef rolls, which were not pre-assembled. I think attempting to roll rice paper rolls at the table is a bit difficult so definitely would have preferred pre-rolled rolls. We shared a pot of green tea. All in all, it was a great meal. The total bill was $24 with tax. As we were finishing up, I asked Doug if he had seen Christiane Amanpour’s interview with Gadhafi’s sons. Doug let me know that he had and then told me a story of when he interviewed Gadhafi’s son Saif. He said he was driven out to his compound and spoke to Saif as he fed beef cubes to his pet Bengal tigers. What?!?!? So that is the difference between consuming the news (me) and producing the news (him) and that is why Doug is so fascinating to speak with. Doug and I talked a lot about his book Arrival City and how he went about visiting all these cities around the world and what he learned along the way. I am mid-way through the book and it is so interesting and a must-read for anyone developing immigration policy, as he offers a real understanding of how these cities or enclaves of arrivals work and how support and consideration could really help. A detail in his book and something we discussed was how rural and farming populations are shrinking around the world as more people move to cities. Because of this, families are no longer as large. Many rural families were much larger as the parents and children took care of the farm, but in an urban setting that changes and large families are not necessary or financially viable. Many experts and Doug believe that the world’s population will level off around 2050. This is good news to all of those people worrying about overpopulation. In general, I think fear mongers of many stripes could really learn something from Doug’s book. On that note, one chapter of Doug’s book juxtaposes two Washington, DC suburbs – Herndon, VA and Wheaton, MD. Both have large populations of Mexican, Central and South American immigrants. I am going to over-simplify here so please read Doug’s book for more details. Herndon did not embrace these arrivals. When a Herndon mayor created an indoor day-labour centre to help the men looking for cash work, he was quickly voted out in the next election. The new mayor closed the centre, made it illegal to gather and wait for cash work, or live in apartments with four or more non-related adults. Without support or means to make money, these arrivals were having a very difficult time surviving. On the other hand, Wheaton embraced the arrivals and saw it as way to revitalize their town and realized that with their success, the town would benefit from the wealth creation. Wheaton engaged with the new arrivals, helped them to access government and non-profit services and celebrated the new multi-ethnic cultures. I will let you guess which town is now more prosperous. Doug and I talked a bit about the revolutions going on in the Middle East. Doug has long covered and traveled to these areas for the Globe and Mail. He said he did travel to Libya at the beginning of the protests. He entered the country through Tunisia into a rebel held area. He would go in for the day, speak with and interview people and then head back to Tunisia. As he saw the conflict worsening, he decided to leave and head back to London and work from there as bureau chief and other Globe and Mail reporters took over. He says many of the reporters he was with in Libya pushed East towards Tripoli and were taken prisoner, beaten and tortured. I think we forget in Canada how lucky we are to have a free press who can question authority without reprisal and it’s something we all need to make sure never changes. I really enjoyed my lunch with Doug. I am a total news junkie so it was incredibly fascinating to talk to someone who has actually been to the places and met the players. Doug is also exceptionally nice – something that always makes a lunch more enjoyable. I look forward to finishing Doug’s book with my new insight and again, so grateful to this blogging thing for giving me such awesome opportunities. Another interesting and thought-provoking lunch date! I am very interested in people who make it their business to analyze and inform others in an effort to learn. I can’t imagine entering Libya during the beginning of the conflict, and I was in Tunisia at the time! My brother-in-law was working in Western Libya, and communication was so sporadic; we didn’t know what was going on most of the time. Thankfully he got out after a few days. That experience really emphasizes the danger, but necessity, of Doug’s work.